The trend: Companies across industries have shown an increased interest in thermoplastics in recent years, including car manufacturing companies such as BMW and Audi, and aircraft manufacturers such as Boeing and Airbus. According to Mordor Intelligence, the thermoplastic composites industry was worth $17 billion in 2017 and is predicted to grow at a compound annual growth rate of 6.24% between 2018 and 2023. This trend can be observed in most parts of the world, with the Asia-Pacific region dominating the thermoplastic market, followed by North America and Europe. Lightweighting. Interest in materials that weigh less continues to grow across industries and across the globe. Costs associated with fuel, maintenance, logistics, and installation are significantly reduced in tandem with a decreased part weight. Less fuel consumption also means less impact on the environment, and this is prompting new fuel economy standards for many regions and industries. When a vehicle or other end product replaces heavier materials with lightweight thermoplastic composites, its lifetime operational costs can drop significantly. Lower cost composite manufacturing. In the past, despite offering several advantages compared to other materials, thermoset composites have been hampered by the capital investment and/or high labor costs, as well as the relatively high cycle times of composites manufacturing. 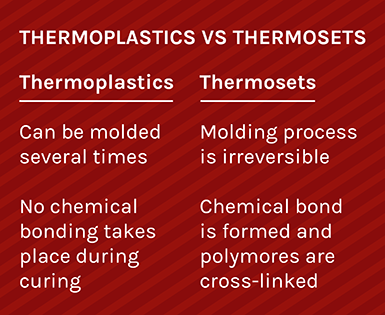 By transitioning to thermoplastic composites, manufacturers gain two key advantages: (1) in-situ processing, which eliminates additional post processing or curing cycles; and (2) overall reduced cycle times of seconds rather than minutes for thermoplastic vs. thermoset composites. Advancements such as 3D printing of thermoplastic composites (discussed below) are opening up new opportunities for thermoplastic composite applications. The trend. The demand for carbon fiber-reinforced polymers (CFRP) was only 43,500 metric tons in 2012 but reached 77,000 metric tons in 2017. This trend follows the same growth pattern previously experienced by composites with other reinforcements, and the pattern is likely to continue. 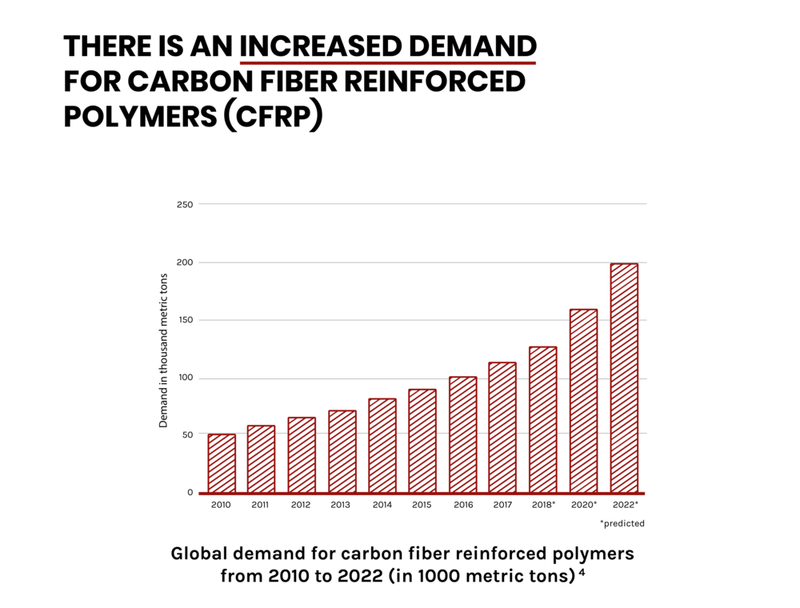 At a growth rate of 10-15% per year, this means that the demand for CFRP will reach 90,000 metric tons in 2019 and well over 100,000 metric tons by 2021. Among fiber types, the carbon fiber thermoplastic composites segment of the thermoplastic composites market is projected to grow at the highest CAGR during the forecast period in terms of both, value as well as volume. Driving forces. CFRP is heavily demanded by the aerospace industry because of its high strength-to-weight ratio – higher than composites reinforced with glass, aramid and other fibers. As it often does, aerospace has served as proving ground for CFRP and led to innovations that are driving down the cost of CFRP manufacturing techniques as well as the cost of carbon fiber itself. As a result, CFRP is poised for accelerated growth in automotive and wind blade industries. Additional CFRP growth markets include construction, infrastructure, tooling, robotics and biomedical. Continued reduction of the cost of CFRP manufacture is critical to the anticipated market growth rates for 2019 and beyond. Processes enabling series production of CFRP components will continue to advance through Technology Readiness Levels (TRLs) in the near term. Automation replaces manual processes in these manufacturing approaches. Manufacturing processes now being used to make components with carbon fiber include compression molding, injection molding, resin transfer molding (RTM), automated fiber placement (AFP), automated tape laying (ATL), filament winding, and most recently, 3D printing – which is likely to grow tremendously in 2019. The trend. Among all composite products, glass fiber is the most widely used reinforcement and will continue to be in 2019 and beyond. Some 69% of glass fiber demand comes from pipe and tank, construction, and transportation. The construction sector will continue to be the heaviest user of glass fiber, and new construction applications are replacing steel with glass-reinforced composites because of their lower density and flexibility. Driving forces. Glass reinforcement offers higher strength than unreinforced plastics, but compared to carbon, aramid and other reinforcements, it is generally limited to non-structural and other less demanding applications. Glass fiber reinforced composite design and manufacturing processes are constantly evolving in order to face competition coming from more traditional industries such as steel. In 2019, the industry will continue to invest in repair and recycling technologies that are meant to help companies comply with stricter environmental regulations. Additional investments in manufacturing technologies will also continue to make glass fiber more affordable. The trend. The automotive market has replaced many metal components with glass fiber-reinforced composites for decades now, but market forces have only more recently created a business case for large-scale use of CFRP on stock automobiles. CFRP automotive applications will continue to emerge in 2019 at a healthy clip. In fact, the compound annual growth rate (CAGR) of CFRP in automotive applications, according to Market Research Future, is expected to be 10.6% from 2017 to 2023. Driving forces. Policymakers in the government are pressuring automotive companies to transition towards lighter manufacturing materials. For instance, the American government has declared that it will increase the fuel efficacy requirements for new automobiles to 54.5 miles per gallon (87.7 km/3.7) by 2025. This means manufacturers interested in the U.S. market will have to make cars that weigh less, and CFRP presents a great opportunity in this regard. For example, an automobile body made of sheet metal components weighs as much as 400 kilograms (889 pounds). The same automobile would weigh 75% less if the metal components would be replaced with CFRP. Companies such as Chevrolet and Mercedes-Benz have already expressed their intention to increase the usage of composite materials, including CFRP. Other car manufacturers are also taking a more active role in transitioning to composites. According to Automotive News Europe, BMW and Audi have committed themselves since 2014 to reduce carbon-fiber cost production by as much as 90 percent within six years. These automakers currently work together with the German government and other partners around the world in a $102-million research project, under the auspices of MAI Carbon Cluster Management GmbH, that seeks to bring carbon fiber into the mainstream. Three of the most important characteristics that car makers look for in materials are a high corrosion resistance, high workability, and high strength-to-weight ratio. CFRP is one of the few materials that meets all these criteria. With composite materials still making up less than 5% of the average vehicle by weight, the potential for automotive composites growth is great in 2019 and beyond. The trend. According to Forbes, 3D printing has been disrupting industry practices for the last decade. As this trend continues, 3D printing specifically of composites is expected to take off in the coming years. 3D Printing Media predicts a huge revenue boost for 3D printed composites over the next 5 years, reaching a revenue of $5B in 2023, and $10B in 2028. Driving forces. Manufacturing industries are investing heavily into 3D printing of composite materials as this method heavily reduces cost, due especially to the elimination of molds. The cost of the molds themselves is significant, but so too is the fact that manufacturing without molds makes it more economically feasible to manufacture components locally, eliminating shipping and customs costs. Carbon fiber-reinforced composite 3D printing is one of the most sought-after additive manufacturing technologies. While printing carbon fibers with a 3D printer has become possible only recently, it is expected that companies will show an increasing interest in this additive technology because it enables (1) potential cost reductions, (2) higher part complexity, (3) functional integration (e.g. building fiber optic sensors right into the composite structure). While CFRP parts in the past have been quite expensive and therefore limited to high-end products, 3D printing promises to make CFRP parts significantly less expensive. This is likely to lead to widespread adoption into cars, airplanes, and other products that will benefit from the lighter weight of CFRPs and the cost competitiveness afforded by 3D printing of these parts. The trend. Continuous carbon fiber represents one of the most important recent innovations in 3D printing of composites, as it allows industries to use composites in several new ways. For many years, it was thought that the technology necessary for printing continuous carbon fiber would only become available in a few decades. Fortunately, people were wrong. While chopped carbon fiber printing still dominates the market, there is an increasing number of devices with continuous fiber printing capabilities. In February 2019, for example, 9T Labs will make available the first 20 of our CarbonKit for our beta testers. This will be followed by the commercial launch of the CarbonKit on 9T Labs website in April. The CarbonKit produces a continuous carbon fiber composite and PA12 thermoplastic. It can be attached to any 3D printer and produce continuous carbon fiber composites in minutes. This kit addresses the limitations brought by conventional composite manufacturing for complex geometries. Driving forces: Continuous-fiber 3D printing of CFRP is expected to open up new opportunities for hobbyists, tech-enthusiasts, researchers in educational institutions, and companies. For example, 3D printed CFRP can be used to create bike components, drones, and models with materials that are significantly stronger than plastic. CFRP can also be used to create prototype parts at significantly lower costs compared to traditional methods. Finally, 3D printed CFRP can help companies create large component parts at a much faster speeds compared to traditional methods; or 3D printing can be combined with conventional composite manufacturing methods and offer huge potential for series production.